With Aibotoys Bulls-and-Cows v. 1.0, we announce our second downloadable software from Aibotoys. Guess the 4 digits selected by AIBO! Aibotoys Bulls-and-Cows is an AIBO version of the traditional puzzle game “Bulls and Cows”. This traditional game was adapted and commercialized as Mastermind® in the 1970’s. In this game, AIBO randomly selects four digits, all different. Your objective is to find out which digits were chosen, in the correct order. Improve your score by finding the combination in fewer moves! With Aibotoys Hangman v. 1.0, we announce today the first of a series of downloadable software from Aibotoys. Now you can play with your AIBO without a game set! Just download the software, install on your Sony AIBO Programming Memory Stick, and play! Download Aibotoys Hangman v. 1.0 now! Play the classic game "Hangman" with your AIBO. See the user manual for details of the gameplay. The game is available today for ERS-311/312/31L, ERS-220/220A and ERS-210/210A, and will soon be available for ERS-7/7M2. Copies of the Aibotoys software packages are distributed on CD-ROM, or by electronic delivery. When shipping insurance is available to your country, we can add a Sony AIBO Programming Memory Stick (model ERA-MS0016) to your order at additional cost, and preinstall it with the software you buy at Aibotoys. Please inquire with us. Worldwide : Robotoys.com. You can buy from Robotoys in full confidence. Robotoys has received a Certificate of Excellence from Sony Corporation for their excellent service. We finally have our new web site design! Every effort has been made to make sure it is as functional as the previous version. If you spot any error on the web pages, please let us know! We need your eyes in making sure nothing escaped our reviews. Thanks! Would you like a free gift, for you and your Aibo? Would you like to be kept up-to date with our next announcement? Click here! Lou M. (alias thedeadeye) from Zelienople PA, USA is our second game pack winner! Lou found the hidden link on our web site on Wednesday 24 December 2002 at 2 PM EST, just under 2 hours after the link was hidden. Lou was sent a copy of Gamepack One for his ERS-31L "pug" Aibo, named Click. Congratulations to Lou! Eric R. (alias intocoasters) from Norfolk VA, USA is our first winner for a free game pack! Eric found the hidden link on our web site on Friday 29 November 2002, 5 days after the link was hidden. As Eric was already an Aibotoys customer, he chose to receive another copy of Gamepack One for his newest Aibo ERS-220, Scutter. Congratulations Eric! Win an Aibotoys Gamepack One! Win a free copy of Gamepack One! At various random times, a copy of Gamepack One will be given away in a contest. To participate, find the hidden image of the Aibotoys Star on the web site and click on it. This will take you to the contest participation page where you can fill out your name and contact information. Every time a game set is available for winning, the hidden image will appear on the web site until it is discovered. The free game set will be awarded to the first person to find the image and reply to the entry form. No shipping/handling charges apply! AiboReversi: The first full-fledged board game for Aibo! Play Reversi, one of the favorite board games around, against your Aibo! When starting Gamepack One, select the AiboReversi game and place your Aibo lying down in front of your AiboReversi game board. Then select the position you want to play using an easy code by pressing the Aibo paw switches, and confirm your move by pressing another sensor (sensor locations vary between Aibo models). Aibo will then think for a little while (usually less than 30 seconds), and use an easy code to tell you where Aibo's move will be. The easy to understand manual lists all the commands you need to go through the game, from correcting mistakes you make to passing a move, to having Aibo tell you all the pieces on the board in case you made a mistake. You can play AiboReversi on the game board provided in the game set, or use any Othello(tm) game board you already have. AiboReversi is written using a 1-ply alpha-beta search on all supported Aibo models, making Aibo look forward in the game as it plays. The Tictaibo game allows your Aibo(tm) to play Tic-Tac-Toe against a human opponent (or a second Aibo) on a 1 foot square board. To play your moves, place Aibo's pink ball on the board game at the position you wish to play, and watch Aibo's signals (varies depending on the Aibo model) to know in which square Aibo's move will be. Aibo 210's signal their move using a code on the the visor lights and by clicking a code with its ears; Aibo 31x's use sound and a color code with their horn to indicate their position. Aibo will use his image recognition to locate the ball on the board, see on which square you played, then make his move by signalling a code to tell you where that move will be. The game continues until one of the players wins or there is a draw. Aibotoys announces today its new game set called "Aibotoys Gamepack One" available simultaneously for the ERS-210/210A, ERS-220/220A, ERS-311/312 and ERS-31L series of Aibo robot dogs from Sony. Aibotoys Gamepack One is a collection of four games for the whole family: AiboReversi, where you can play the Reversi game against Aibo; AiboMemory, where you can exercise your memory by matching similar cards on a board; Tictaibo, the Tic-Tac-Toe game for Aibo and first third-party game available for Aibo; and AiboDice, where Aibo rolls a virtual die for any other game you play. You can play AiboReversi on the game board provided in the game set, or use any Othello(tm) game board you already have. Aibotoys Gamepack One comes with all the necessary accessories and easy to follow instructions. Full press release available here. The first third party game for your Aibo ERS-210! The Tic-T'Aibo game allows your Aibo(tm) ERS-210 to play Tic-Tac-Toe against a human opponent (or a second Aibo) on a 1 foot square board. 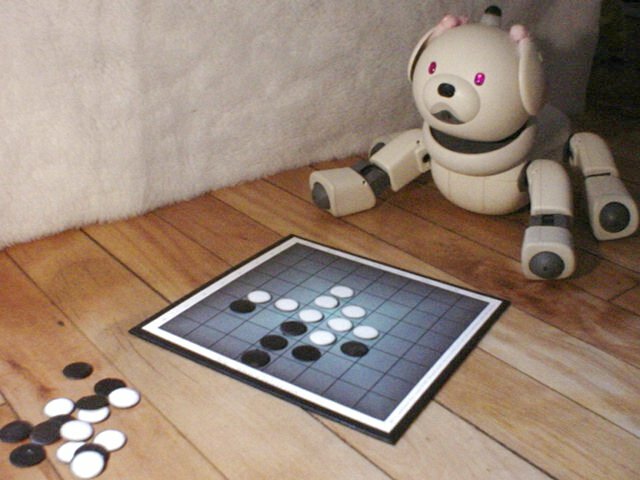 To play your moves, place Aibo's pink ball on the board game at the position you wish to play, and watch Aibo's ear movements to know in which square Aibo's move will be. 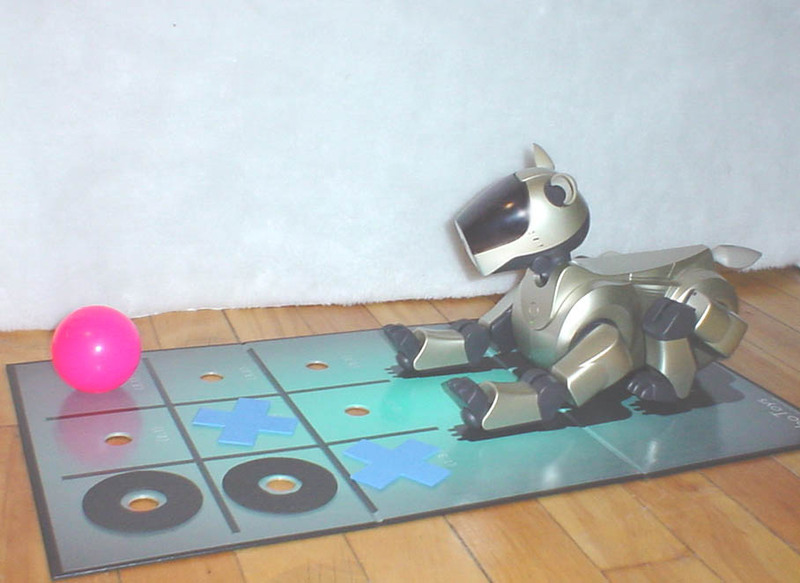 Aibo will use his image recognition to locate the ball on the board, see on which square you played, then make his move by signalling with his ears to tell you where that move will be. The game continues until one of the players wins or there is a draw. As you play, place X's and O's on the game board so *you* remember where the pieces are... Aibo will remember by himself! Full press release available here.